I lead a pretty busy life. Between a full time job, a few side assignments, triathlon training, Museum duties, etc etc…I actually rarely have time to cook dinner. What I like to do to is make big batches of things on Sundays and eat it through the week – lunches & dinners! Usually the meals are a modified version of the original, but it essentially stays the same. Kinda boring? For sure. I’ve tapped out on a Wednesday before. But if you make some really yummy, you’ll be looking FORWARD to meals! 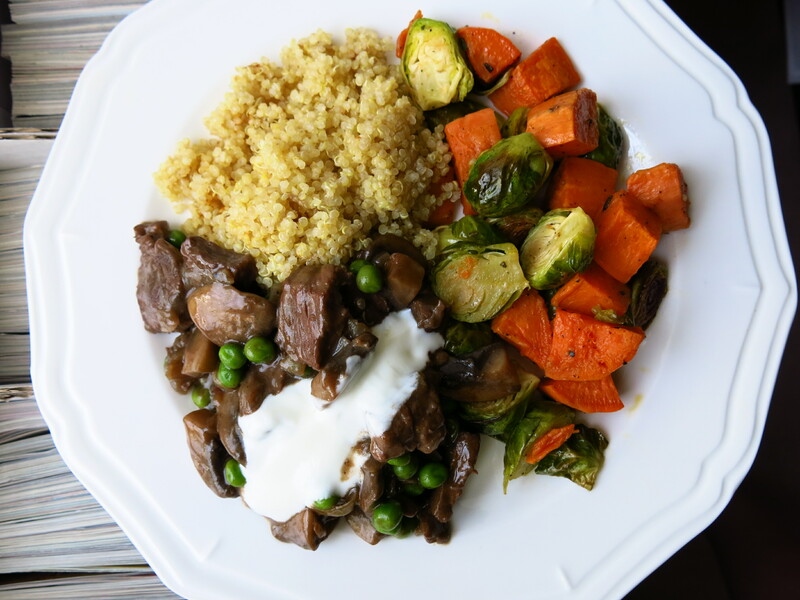 One of these meals was a mega-sized beef stroganoff (I live alone so my big batches do go a long way) with a side of roasted yams & brussel sprouts, served with quinoa. This recipe was a modification of the one from America’s Test Kitchen. I wound up adding a lot more stuff to it. I don’t eat a lot of meat, so I spent a long time at the beef section at my local grocery store, carefully scrutinizing the fat marbling. Coincidentally, a representative from “Beef BC” (I don’t think that’s the actual name, but like the Marketing/Community Relations person from the cattle association or whatever) was there to help customers with questions, recipes, etc. And he asked if I needed help! And I did! I told him I was trying to make beef stroganoff and he ascertained that my —– steak (see – I don’t even remember what it was called) was a fine and appropriate choice. I also picked up a beef buying guide and marinade notecard from his kiosk. Anyway – basically what you do – sautee the beef. Using all the awesome fat and crusty bits in the pan, fry your mushrooms and onions. Once they are decently cooked, add back in your beef and some stock/stock&water. I believe you can use a variety of flavourings to enhance the dish: mustard powder, regular mustard, Worchestershire sauce…..I also added in a generous splash of red wine. Let reduce and that sauce will turn into something silky and rich – season with salt & pepper to taste. As you can see – I added a cup of frozen peas at the end (just stirred in). 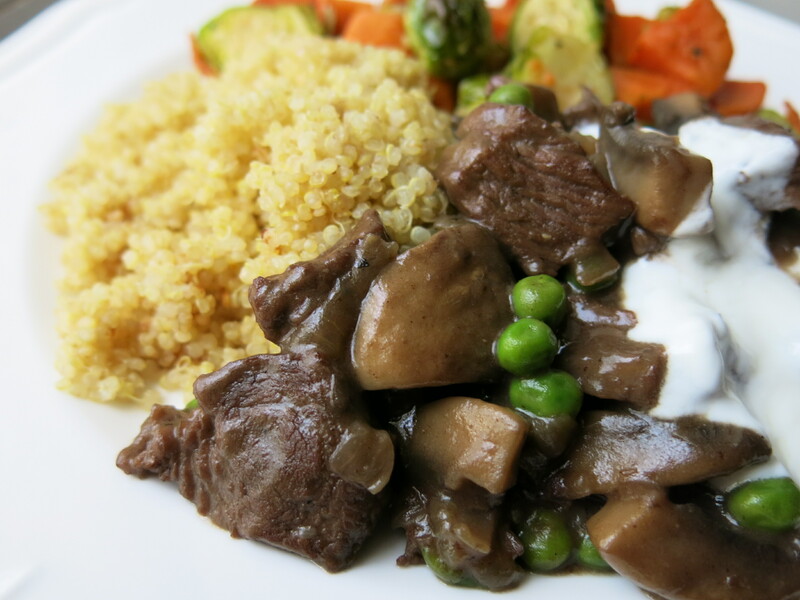 Traditionally you use sour cream when serving so you can make this dish even more succulent – but I used thick Greek yogurt instead. Same results! Yams & sprouts were tossed in oil, salt & pepper and roasted at 400F until done. Do this while you’re cooking – it will all finish roughly at the same time. Awesome meal overall and I even had enough leftover to make an “in case of emergency” frozen meal at the end of the week!